Washington, D.C. , December 16, 2011 – A Colombian army general acquitted today in one of the country’s most infamous human rights cases “actively” collaborated with paramilitary death squads responsible for dozens of massacres, according to formerly secret U.S. records obtained under the Freedom of Information Act by the National Security Archive. Once the third-highest-ranking officer in the Colombian military and later a top adviser to President Álvaro Uribe’s Department of Administrative Security (DAS), Iván Ramírez Quintero was acquitted today in the torture and disappearance of Irma Franco, one of several people detained by the army during the November 1985 Palace of Justice disaster. The exoneration comes despite substantial evidence, including declassified U.S. embassy cables, linking Ramírez to the disappearances. Among the documents are reports that the missing individuals were “tortured and killed” by members of the Charry Solano Brigade, the unit led by Ramírez at that time. Two former senior army officers, Col. Alfonso Plazas Vega and Gen. Jesús Armando Arias Cabrales, have already been convicted in the Palace of Justice disaster and remain the only people sentenced in the now more than 25-year-old case. More than 100 people, including 11 Supreme Court justices, perished during military operations to retake the Palace of Justice from M-19 insurgents who seized the building in November 1985. A document previously published by the Archive blamed “soldiers under the command of Col. Alfonso Plazas Vega” for the deaths of individuals detained by the army following the raid. The declassified file on Gen. Iván Ramírez Quintero, the so-called “godfather of army intelligence,” portrays him as a shrewd and corrupt spymaster who shared sensitive intelligence with illegal militia groups, cultivated relationships with drug traffickers and notorious paramilitary figures, and engaged in “scare tactics” to take down his political enemies. U.S. contacts in the Colombian military took a similarly dim view of Ramírez. One former colonel said he was “convinced [that Ramírez] has gone far beyond the passive phase with paramilitaries and is actively supporting them.” The colonel was “concerned about the potential direction the Colar [Colombian army] could take if Ramirez abuses his position as IG [inspector general] or, worse, if he is allowed to rise to even higher positions in the armed forces hierarchy.” Ramírez is repeatedly characterized as the “godfather of army intelligence” with influence “so pervasive within the military intelligence community” that he maintained control over intelligence assignments even from non-intelligence posts. 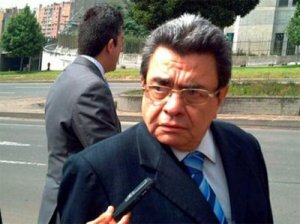 Another retired Colombian officer told the Embassy that Ramírez had been the “godfather” of Colombia’s “intelligence mafia” for more than 20 years. The general “surrounded himself with loyal subordinates who ‘covered up for him'” and was connected to “shady elements” inside the army’s 20th Military Intelligence Brigade,” according to a cable reporting on the meeting. The 20th Brigade was established in 1990 on the recommendations of a U.S. intelligence team, and Ramírez was its first commander. “Fundamentally designed for covert operations,” the brigade’s members were attached to army units across the country, according to a U.S. Army report (See page 79.). Personnel worked “undercover and in civilian clothes,” reporting only to division commanders and other intelligence officers. The brigade became the most visible symbol of Colombia’s corrupt and abusive intelligence establishment, and was tied to political assassinations, the torture of suspected guerrillas, and Colombia’s brutal paramilitary forces. The State Department’s human rights report for 1997 singled out the intelligence brigade for “death squad activity,” a charge also leveled by Ambassador Frechette as he left the Bogotá post late that year. In May 1998, shortly before Colombia announced plans to dismantle the 20th Brigade, the State Department cancelled Ramírez’s U.S. visa. In an unusually passionate memo on the moral dilemma faced by U.S. policymakers in Colombia, the State Department’s desk officer for Andean Affairs, David Passage, made a rhetorical plea for self-reflection on the part of the Colombian army and the military intelligence system in particular. Colombia needed to develop “credible and defensible intelligence gathering techniques instead of 12-volt batteries and rubber hoses,” Passage asserted, strongly implying the Colombian military’s penchant for torture techniques. Yes, we know the Colombian military doesn’t control all the paramilitary organizations – but we also know there are enough ties between many of them and Colombian military officers that it becomes impossible for us to turn a blind eye. NO, we’re not going to identify them; you know who they are. Heal yourselves before you ask us for help! If you don’t understand why we withdrew Gen Ivan Ramirez’s visa, then we’re too far apart to be able to cooperate with each other. Three months later, a Washington Post report detailed extensive ties between Ramírez and paramilitary groups and also identified him as a “liaison and paid informant for the Central Intelligence Agency,” charges that he angrily denied. The damage done, Ramírez was passed up for promotion in 1999 and sent out of the country to serve as military attaché in Chile. Never charged for his alleged paramilitary ties, Ramírez was appointed by President Álvaro Uribe as a special adviser to the country’s top civilian intelligence organization, the Administrative Department of Security (DAS) in 2006. The spy agency was subsequently found to be running a Watergate-style illegal-wiretapping operation targeting journalists, judges and human rights defenders. Arrested for disappearances in the Palace of Justice case in 2008, Ramírez spent more than three years in preventive detention pending investigation and trial. Jailed former paramilitary chief Salvatore Mancuso has testified that both Ramírez and former DAS agents collaborated with his illegal forces. The revelations about Gen. Ramírez are drawn from Colombia and the United States: Political Violence, Narcotics, and Human Rights, 1948-2010, a recent addition to the Digital National Security Archive. Edited by Michael Evans and published by ProQuest, the set consists of more than 3,000 declassified diplomatic and intelligence documents on Colombia’s decades-old conflict.